This Spring was busy and full of Fish! We had a very busy spring with Sweetwater Guide Service. We have seen evidence of many healthy trout and one of the best fishing springs we have had in a few years. Many browns and rainbows have found the net, as well as a good mix of Walleye's and high numbers of Shad. Now booking Summer Smallmouth Bass trips. July, August and September are prime time for Smallmouth Bass fishing. High number of fish per trip, great for beginners and families, Call 570-647-7030 to book today. Ron with a Delaware debut Rainbow trout on the fly rod. Catching big browns in the rain on Mothers Day. Ken loving the Shad fishing. A ladies date with an American Shad, She looks happy! 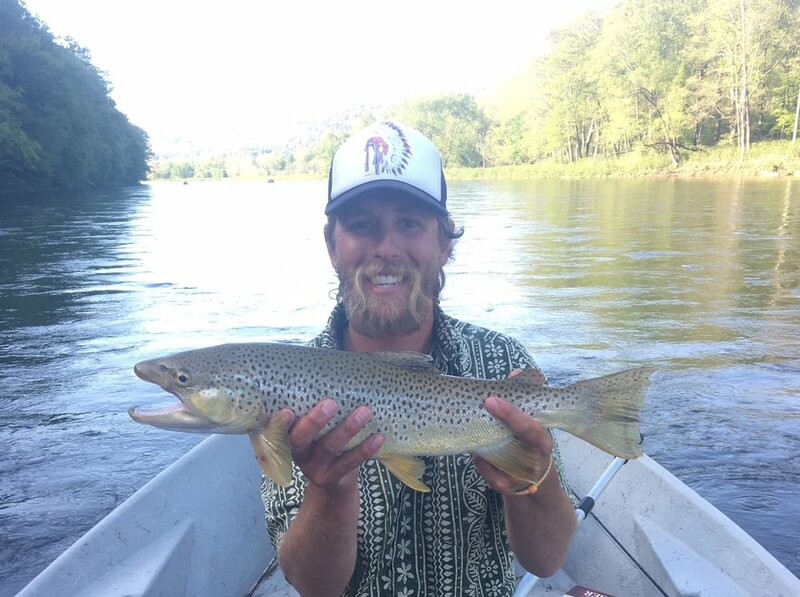 A chunky 18" Brown on a dry fly for Guide Evan. 21.5" of Brown trout on a sz 18 parachute. 22" of Brown trout on a sz 18 parachute. Mark with 1 of 18 Shad on this rainy day. The youngin battled this Brown trout to the net. Kevin picks up an American Shad on a stonefly nymph. The father daughter, bass walleye double. Rob and Allison, wading for trout. Pete slams a 26" Striper on 6lb test and barbless hooks, Nice work! Spring fishing starts off hot!